Supreme Court nominee Brett Kavanaugh has nothing but contempt for international law. But he has shown uncritical deference to executive power, particularly in the so-called war on terror cases. The two primary sources of international law are treaties and what’s known as “customary international law.” Ratified treaties are part of domestic US law under the supremacy clause of the Constitution, which says treaties “shall be the supreme law of the land.” Furthermore, it has long been established that customary international law, which arises from the consistent and general practice of nations, is part of US law. Although he professes to interpret the Constitution as written by the founders, Kavanaugh has apparently overlooked the supremacy clause and simply scorns customary international law. Paust also referenced a 2016 article he wrote in the Houston Journal of International Law documenting this fact. Kavanaugh, however, erroneously conflates international law with foreign law. The US agrees to the terms of treaties it ratifies. And in most instances, the United States can opt out of a customary international law norm if the US objected while the norm was being developed. Foreign law, on the other hand, is the law of other countries — such as French law, German law, etc. In the 2016 case of Al Bahlul v. United States, a Guantánamo detainee argued that since “conspiracy” was not an offense under the international laws of war, he should not be tried for conspiracy before a military commission. For 12 years, while serving as a judge on the DC Circuit Court of Appeals, Kavanaugh had the opportunity to rule on several cases stemming from the “war on terror.” In nearly all of them, he demonstrated nothing but disdain for international law and an uncritical deference to executive power. During the Bush administration, the Supreme Court checked and balanced the executive branch in several war on terror cases. They included Rasul v. Bush (which established that federal courts have jurisdiction to hear Guantánamo detainees’ habeas corpus petitions); Hamdi v. Rumsfeld (which held that a US citizen held as an enemy combatant has due process rights to contest his or her detention); and Hamdan v. Rumsfeld (which concluded that Bush’s military commissions violated the Uniform Code of Military Justice and the Geneva Conventions). In 2008, the high court ruled in Boumediene v. Bush that Guantánamo detainees held as enemy combatants have the right to file habeas corpus petitions in US federal courts to challenge their detention. “Prominent among those judges is Kavanaugh,” Edith Roberts wrote at SCOTUSblog. In the 2010 case of Al-Bihani v. Obama, Kavanaugh ruled that the Authorization for Use of Military Force (AUMF), under which al-Bihani was held as an enemy combatant, should not be interpreted in light of the international laws of war. Paust noted in a law review article that Kavanaugh “embraced and basically relied merely on a radical ahistorical and ultimately anti-constitutional minority viewpoint” in that statement. 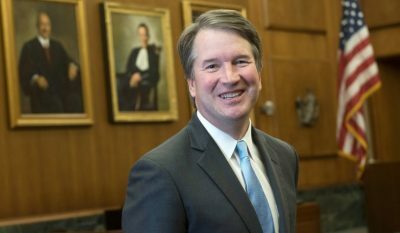 Kavanaugh “prefers a radical and dangerous view that ‘courts may not interfere with the President’s exercise of war powers based on international-law norms that the political branches have not seen fit to enact into domestic U.S. law,’” Paust wrote. Another example of Kavanaugh’s disrespect for international law and fondness for executive power is the 2009 case of Kiyemba v. Obama.Seventeen Uighur men found to be unlawfully detained at Guantánamo feared being returned to China in violation of the United Nations Convention Against Torture and a federal statute, given the likelihood that they would face torture upon their return. Kavanaugh took the position that courts must defer to the president’s determination of whether there is a likelihood of torture upon return. Most of the Uighurs were ultimately relocated to other countries, but many remain in detention. Kavanaugh’s deference to the president goes even further. In a 2014 law review article, he wrote that the take care clause of the Constitution requires the president to enforce the law, “at least unless the President deems the law unconstitutional, in which event the President can decline to follow the statute until a final court order says otherwise.” Kavanaugh would create a dangerous presumption in favor of a president who refuses to follow the law. If confirmed to the Supreme Court, Kavanaugh will almost certainly defer to the president’s wartime decisions during the perpetual war on terror. He will likely extend that deference to Donald Trump’s immigration policies under the guise of “national security.” And Kavanaugh’s frightening theory will encourage the president to disobey any law he deems unconstitutional, including customary and treaty-based international law. Marjorie Cohn is professor emerita at Thomas Jefferson School of Law, former president of the National Lawyers Guild, deputy secretary general of the International Association of Democratic Lawyers and an advisory board member of Veterans for Peace. An updated edition of her book, Drones and Targeted Killing: Legal, Moral, and Geopolitical Issues, was recently published. She is a frequent contributor to Global Research. Featured image is from National Review.